What’s a good sign that Google (or any company for that matter) is about to unveil a new product? We see massive discounts on last year’s product in order to make room for the new guy. 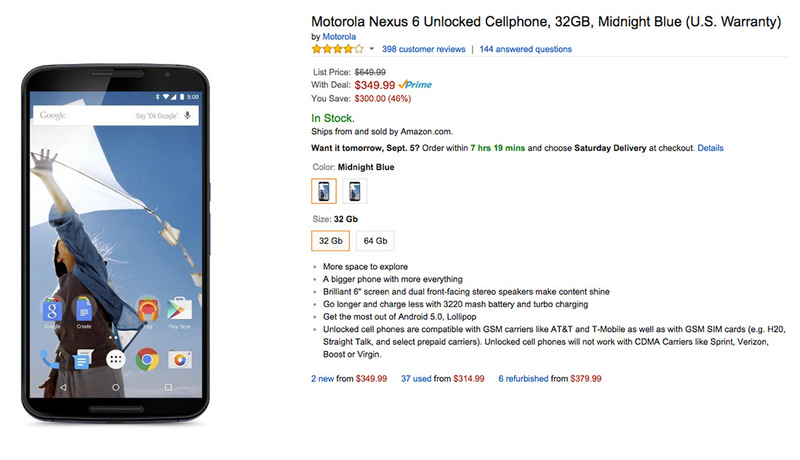 That could be happening at the moment with the Nexus 6, which just dropped $150 in price at Amazon to $349. Seriously, the Nexus 6, a whale of a phone that started at almost $700 a year ago, can be bought for $349. Amazon has both white and blue in both 32GB and 64GB configurations available. The 32GB model is at the $349 price point, while the 64GB model has dropped as well, down to $399. That’s a hell of a price! For those still scared of its size, I’ll just say this – the people who own the Nexus 6, love the damn thing. It’s one of those phones with a cult following, where those who took a chance on a 6-inch phone have found that they absolutely love the size. And hey, it’s stock Android after all.